Welcome December ! As we continue to enjoy our balmy weather in Florida, we think everyone is still enjoying getting out and gardening, or maybe getting our gardens ready for cooler weather. One of the great things about gardening is that you can do it indoors or out, so even if the weather was to turn coolish, we can enjoy still having our "green" around us inside our homes, condos, apartments and offices. 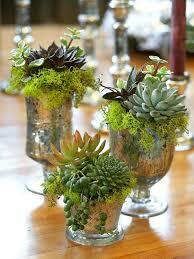 Perhaps the most perfect plants for indoors are succulents! Some people may not realize that succulents do NOT need full sun, or even a lot of sun, they just like some bright light around them and our kitchens, bathrooms, sunny windowsills are the perfect places for having mini gardens. I am continually inspired by pictures on Etsy, Pinterest and garden sites of the different ways that people have found to display their succulents. 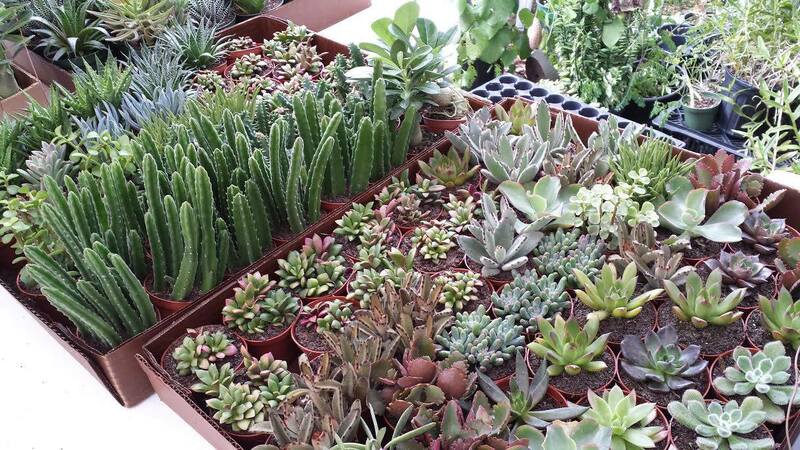 The mini succulents we sell are the perfect size to fit into a myriad of containers, you just have to use your imagination ! Many of us have old flower vases, assorted glass goblets, or a trip to the Dollar Store or local Goodwill and Salvation Army store, can be valuable for finding cheap, useful, unusual containers. Unlike most plants that do want a container with drainage holes, succulents can live and flourish in containers without drainage. It's all about the moisture control. 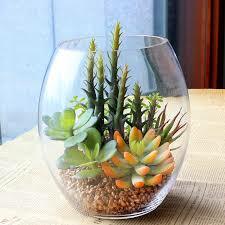 We usually recommend watering succulents only once every 2 to 3 weeks. When you do water, you want to impart enough moisture to satisfy your plant, but you do not want to drown it so much that the excess moisture does not evaporate. Having rocks/pebbles in the bottom of the container greatly helps control excess moisture so that your plant is not sitting on a constantly wet bed. What do you do if your mini succulent starts getting too leggy, or is outgrowing the container? Simply cut the stem back, it will regenerate. You can even remove the entire plant, cut off excess stem for the bottom, and place the top part of the plant back into your container - it will quickly grow new roots ! Trimming back is also a great idea for your larger succulents in your outdoor gardens. 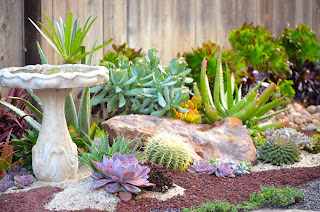 One of my favorite succulent gardeners is a lady named Laura Eubanks with Design for Serenity in California. You can find her under that site name, on Facebook, and on youtube.com, Laura has some great informational videos about working with succulents. I highly recommend checking her out for inspirational ideas plus lots of great practical advice. Recently on Facebook, Laura posted a pic of one of her garden installations which has inspired me to start a ground succulent garden in a spot in our yard that definitely needs some pizazz. Laura loves and highly recommends using different shades of rock and pebbles which really help to highlight the plants. What I love, is that you can easily find different color pebbles and rocks, for thrifty prices, at your local Dollar Store, Pet Stores and garden centers. Check Laura out, google succulent gardening ideas etc and we are certain that you will find inspiration for starting or continuing your succulent dreams ! Stop by our booth each week at market, or, set up an appointment with us, as we continually have great mini plants that you won't find anywhere else ! This coming weekend, the Mitch Armstrong Nursery crew of Larry, Susan and Jeremy will be manning the helm at our booth at Saturday Morning Market, while Mitch and I head to the wilds of...Ft. Myers ! Joining up with one of our favorite Arts & Craft show promoters, we will be at the Bell Tower shops area of north Ft. Myers on Saturday and Sunday. In addition to our Succulents and Air plants, this week we have some great new perennials for your gardens, including some beautiful new foliage plants of Xanadu & Fiddle Leaf Ficus. Our 3 gallon Rosemary plants are especially gorgeous. We are stocked back up on Passion Vines and the fruiting ones (Purple Possem) are starting to bloom and produce yummy passion fruit. We hope everyone has a wonderful holiday month and in between shopping, don't forget to get your nature therapy by getting dirty, in the garden, at least !